The e-Stewards Survey Incentive Program has gotten off to an excellent start with our first survey going live April 7th, 2014. The purpose of the survey is to collect valuable demographic data, which may be used to inform market strategies. Vintage Tech Recyclers generously donated a refurbished iPad 2 to incentivize our inaugural survey. They have also offered to share the link to our online survey with their networks and affiliates, ensuring we get plenty of responses. Recently, R2 Solutions published a paper and a press release asserting R2 compliance with the Basel Convention. This was rather surprising to us here at BAN because it is the lack of compliance with the Basel Convention and its decision to ban the export of hazardous waste to developing countries that precipitated the environmental community and many recyclers walking away from the R2 process to create the e-Stewards Standard which DOES comply with the Basel Convention and its decisions. Please read the quick rebuttal written by BAN to set this record straight. BAN continues to be appalled at the horrific management of CRTs and CRT glass that is on display in many parts of the US. We are finding that many agencies, charged with enforcing RCRA and the CRT rule are neither knowlegeable nor proactive about accumulative speculation of CRT glass, about the dangers of outdoor storage, dangers of toxic phosphors, etc. Earlier, BAN exposed the abandonment of CRT glass in Yuma, Arizona by the company Dow Management. A recent visit there revealed that much of that material remains there to this day. The latest disaster we have witnessed occurred in Utah. Please read our short report about our findings there. Earlier, BAN published a clarification of what the e-Stewards Standard says about landfilling CRT glass. It is allowed but only as a “last resort” and under strict conditions. Today we have published official guidance for Certifying Bodies and e-Stewards about the various options and how the term “last resort” will be verified. In the next days, BAN will be publishing a Sanctioned Interpretation for Version 1 to align the two standards on this issue. With our prohibition on export, prison labor, and forbidding any corporate facilities from not being certified, the e-Stewards Standard continues to be the most restrictive standard with respect to social and environmental criteria for overall management of this critical waste stream. Next, BAN will be working on proposed rules to prevent irresponsible stockpiling and abandonment. Stay tuned! In order to continue making improvements and provide the highest level of integrity to the e-Stewards program, an update has been initiated regarding the terms of the website policy for candidate recycling companies and all locations to be listed as recyclers “in-process” for certification. 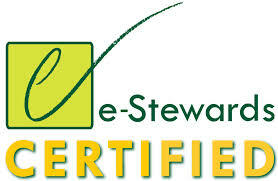 From April 21, 2014 and later, candidates for certification must first complete their Stage 1 audits prior to being listed on the e-Stewards website as “in-process”. “In-process” company locations currently listed on the e-Stewards website (i.e. prior to April 21st) will have a maximum of six months from the time they were posted to complete Stage 1 audits, or meet the original established deadline, whichever comes first. Please see the e-Stewards website for the complete policy for website listing at www.e-stewards.org. La Red de Acción de Basilea (BAN) otorgó hoy el almacenamiento y la información de gestión de la empresa Iron Mountain el e-Stewards ® designación empresa, reconociendo su liderazgo en la respuesta al problema de la contaminación de más rápido crecimiento en el mundo: mal reciclados o eliminados de la tecnología, conocida como e-waste. Iron Mountain se une a los miembros fundadores del programa, que incluyen Wells Fargo, Capital One, Bank of America y Samsung. También se unen a las ciudades de Seattle, San Francisco y San José, así como el condado de Santa Clara, sede de Silicon Valley. Iron Mountain ha ganado el e-Stewards designación empresa por su compromiso con el manejo seguro y adecuado de la basura electrónica mediante el uso de e-Stewards certificados plantas de reciclaje. La compañía también ayuda a procesar los clientes de e-waste segura con e-Stewards recicladores certificados. Con su servicio Secure Disposición de Activos de TI, Iron Mountain ayuda a los clientes reciclar productos electrónicos fuera de servicio, por lo que los medios de comunicación sean inutilizables y reciclados por un reciclador de e-Stewards. Iron Mountain también fomenta el uso de e-Stewards reciclado siempre que sea posible para promover los esfuerzos verdes y mitigar el riesgo debido al vertido inadecuado de residuos electrónicos. “Destrucción segura es tan importante como el almacenamiento seguro, el contenido debe ser gestionado a través de todo su ciclo de vida”, dijo Steve Nottingham, vicepresidente senior y gerente general de la copia de seguridad de datos y soluciones de recuperación, Iron Mountain. “Aunque muchas empresas practican la destrucción segura de su información sensible en papel, que no pueden seguir un proceso seguro para la destrucción de datos confidenciales que residen en las cintas de respaldo, discos duros y los activos de TI. Iron Mountain de Secure IT servicio de Disposición de Activos utiliza un e-Stewards electrónica de reciclaje, y por lo tanto ayuda a las empresas reciclar de forma segura todos los activos de TI, minimizando así los riesgos de pérdida de datos y costosa incumplimiento, al tiempo que refuerza la responsabilidad ambiental “. Más de 70 grupos ecologistas de todo el mundo han respaldado el e-Stewards Estándar, incluyendo a Greenpeace, el Sierra Club, y el Consejo de Defensa de Recursos Naturales. La lista completa de e-Stewards Enterprises está disponible en: http://www.e-stewards.org. Guía para Implementar R2 y e-Stewards . Cuál estándar adoptar, para qué sirven, cómo se hace. THE GOAL The world of responsible electronics recycling has been evolving at a rapid pace over the past few years. Customers large and small are concerned about branding and about the potential of their equipment ending up in the wrong hands or the wrong country. Customers are seeking assurances from recyclers and asset managers in the form of third party certification programs to assure themselves that data is properly sanitized and that negative environmental and social impacts are avoided. E-­‐STEWARDS VS R2 Industry responded with the release of two standards:  The e-­‐Stewards® Standard for Responsible Recycling & Reuse of Electronic Equipment (2009) (including ISO 14001), &  Responsible Recycling (R2) Practices for Use in Accredited Certification Programs for Electronics Recyclers (2008). While the approach is different, both standards sought to fill the need for independent verification of responsible performance in the electronic recycling and asset management industry. WHY NOT BOTH? Many believed that one or the other of the standards would prevail. In fact, rather than choosing one standard over the other, many companies are pursing certification to both. For organizations already pursuing e-­‐Stewards, it is an easy choice, as most of the requirements in R2 are covered in e-­‐ Stewards, thus making it a straight forward process to make up the difference and be audited to both standards in one audit, saving time and money. For those pursuing R2, there are a substantial number of additional requirements, but with them come added assurances to customers and potential new markets. COMPARING THE TWO STANDARDS Ultimately, it is the role of the certification bodies to determine that requirements in both standards have been met, however this document is intended to provide guidance for people considering certification to e-­‐Stewards and R2 at the same time. The differences in the two standards are significant, however in most cases e-­‐Stewards exceeds the requirements in R2, with a couple of exceptions:  FM Management Plan,  Site security, &  Transport,  Data destruction processes shall be reviewed and validated by an independent party on a periodic basis.